Somewhere between breakfast and dessert lies figs. One of my favorite food memories is devouring a hot slice of baguette dripping with melted gorgonzola, topped with plump fresh figs and a liberal drizzle of honey. Only after the dinner guests had licked the cutting board clean did the cook inform us he had picked the figs from the sketchy tree in the backyard of his apartment in the Mission. Now these beautiful figs, I picked right off the tree at my friend’s vineyard (thanks, Monsons!). As we squished through the muddy orchard rows, I greedily yanked at these black turgid teardrops. Overwhelmed with my sack of 30 or so gorgeously ripe figs, I decided to snack on a few au naturale, but roast the rest using David Lebovitz’s recipe to savor over the week. He says you’re supposed to spoon these babies over yogurt or ice cream, but it’s really tough not to just pop them like candy. Use a baking dish that will allow you to bake the figs in a single layer. Preheat the oven to 400ºF (200ºC). 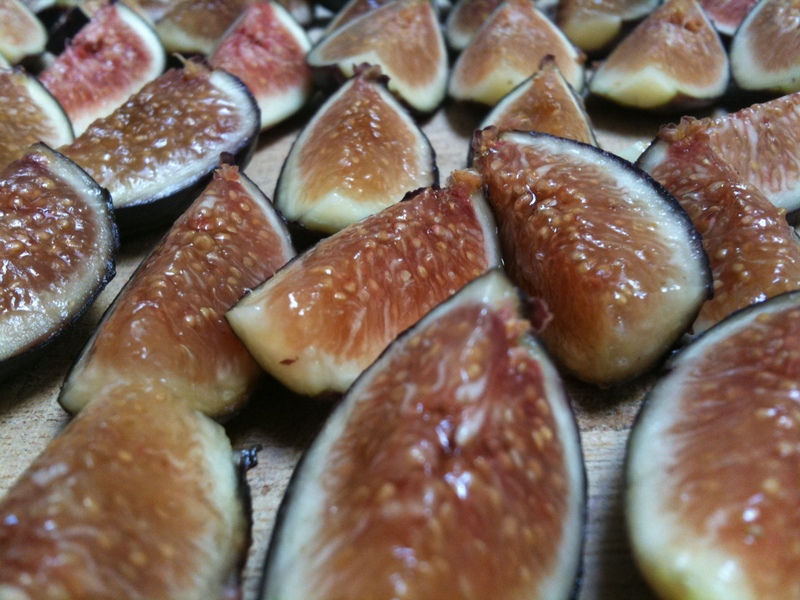 Toss the figs in a large baking dish with the thyme, red wine, brown sugar, honey, and lemon zest. 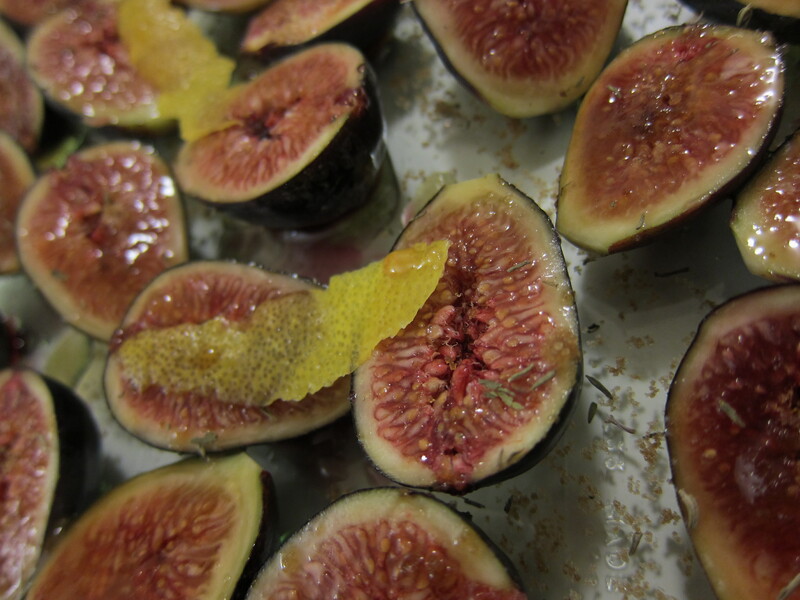 Turn the figs so that they are all cut side down in the baking dish, in a single layer. 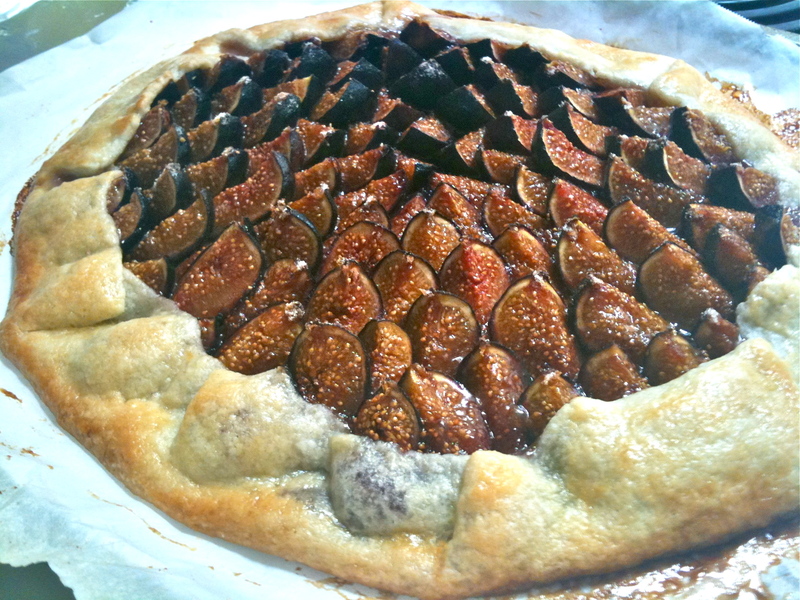 Cover the baking dish snugly with foil and bake for 15 to 20 minutes, or until the figs are softened and cooked through. When done, remove the baking dish from oven and let the figs cool completely. 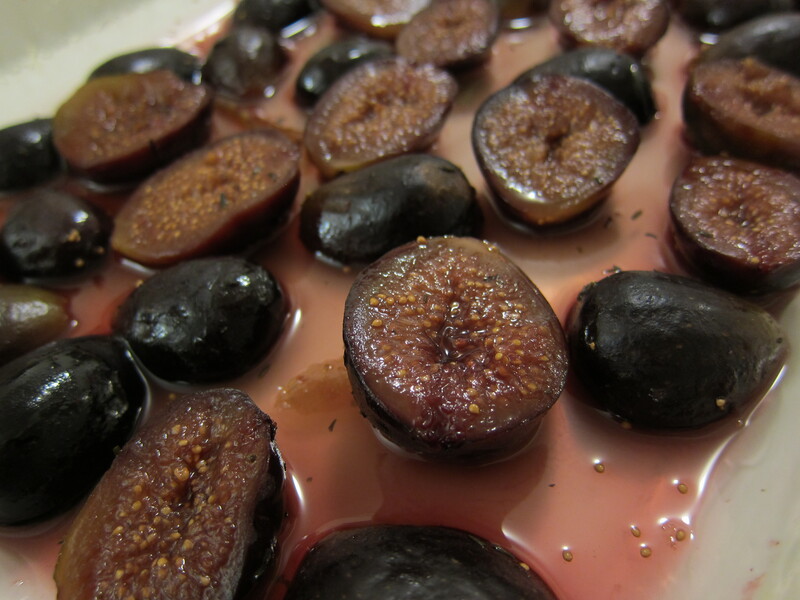 Roasted figs can be stored in the refrigerator for up to one week. 6-8 servings. The dumbest thing you can do on a hot day is bake, but a crate of ripe figs and a birthday celebration convinced me otherwise. No regrets — I am conceitedly in love with the masterpiece of my sweaty labor. Figs are so beautiful, even when simply sliced into quarters. Their gooey insides are translucent shades of pink and white like miniature watermelons. For this freeform tart, I began with an easy food processor dough. With the canvas rolled out, I then sprinkled a bed of cinnamon sugar and began placing figs in a startburst pattern starting from the center. It’s a bit like erecting a tepee at the start — you have to balance three slices to stand up straight, but then it’s easy to lay on concentric circles of slices thereafter. 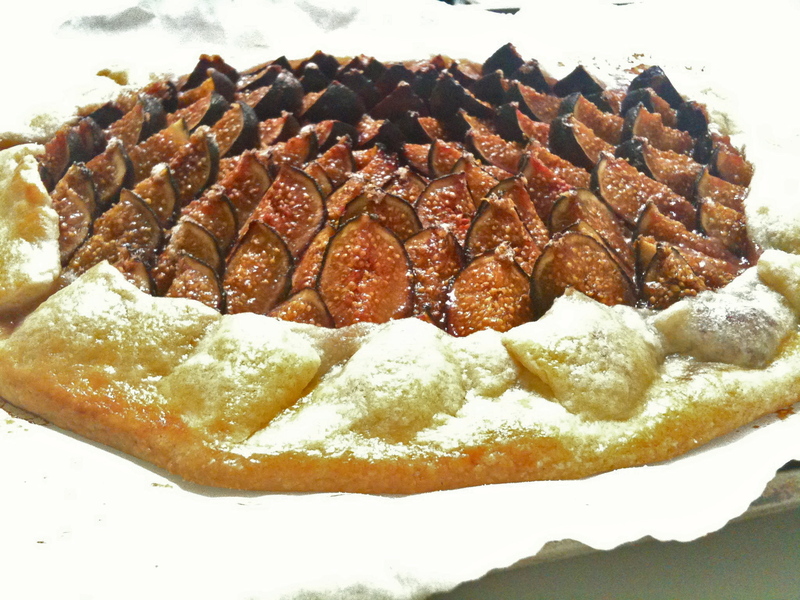 The result: fig tart, fruit art (FART?). Here it is fully-baked after a liberal dusting of cinnamon sugar and the crust having been folded over and egg-washed. As usual, I had some leaking issues because I rolled the dough greedily thin (I was trying to maximize surface area)! Not to worry, it was still effing delish — lightly sweet and caramelized as only fresh figs can taste. We enjoyed it with a rich, port-like dessert Cab from Big Dog Vineyards. who needs brains when you have this much beauty? Combine the sugar and cinnamon. Remove stems from the figs and cut vertically into quarters. Roll dough on a lightly floured surface into an 11-inch freeform circle. Transfer the dough to a baking sheet and sprinkle with 1 tablespoon of the cinnamon sugar. 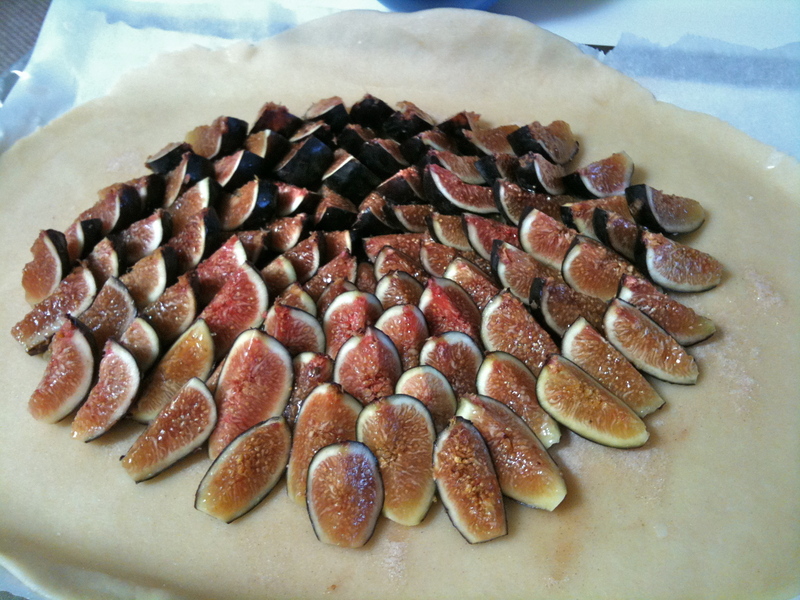 Starting in the center, cover dough with overlapping circles of fig, leaving a 1 1/2-inch border on the outside. Sprinkle with remaining cinnamon sugar mixture. Raise dough border to enclose the sides of the tart, letting it drape gently over the fruit. Press down on the dough at the baking sheet, snugly securing the sides and bottom; be careful not the mash the fruit. Gently pinch the soft pleats that form from the draping. Brush with egg wash and sprinkle with sanding sugar, if desired. 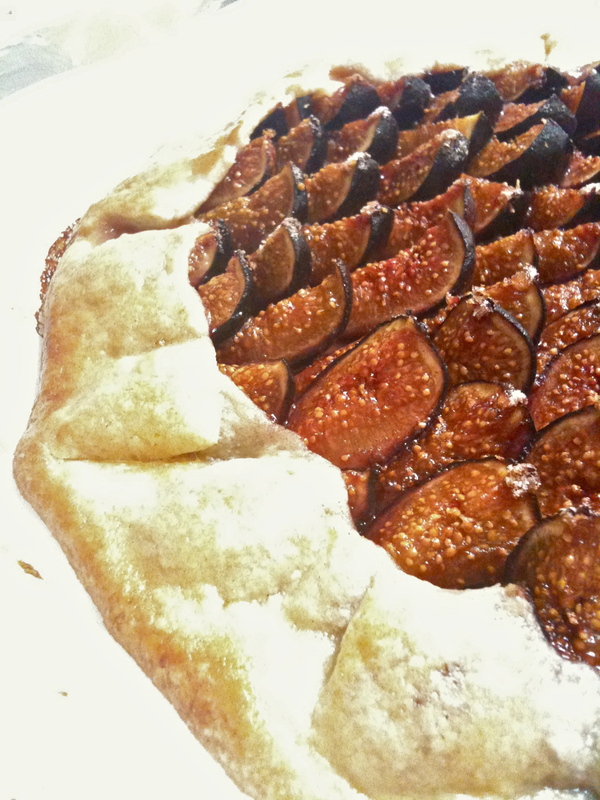 Bake for 20-25 minutes, until the crust is golden and the figs are softly and lightly caramelized. Cool for 10+ minutes before serving. Serves 6-8. Butter can do no harm. Take for example: crust. Savory or sweet, this golden brown vessel can be your means to a delicious end whether it be a latticed pie, custard tart or quiche. When what matters most is getting a piece of buttery crust into your mouth as quickly as possible, the crostata should be your vehicle of choice. 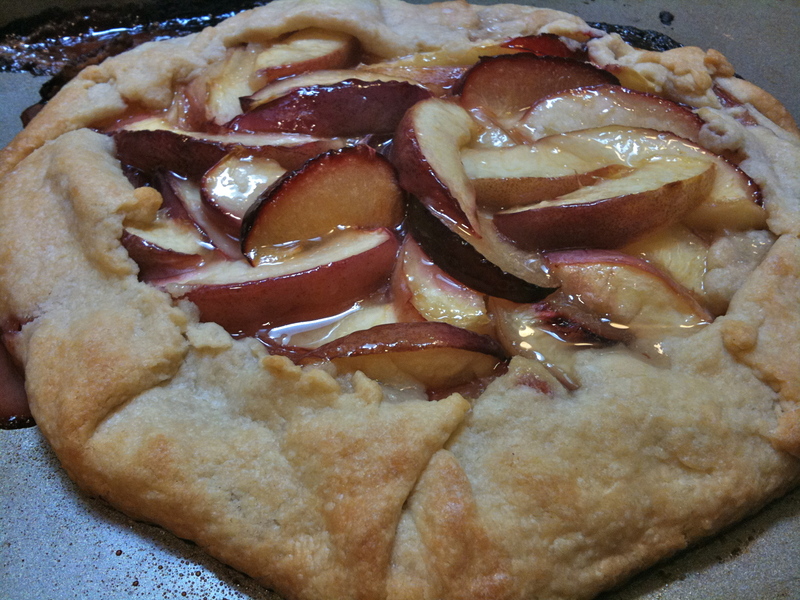 A crostata is a rustic free-form tart — simply a round of dough piled with a mound of fruit with the sides folded over. It’s as easy as pie… only easier! 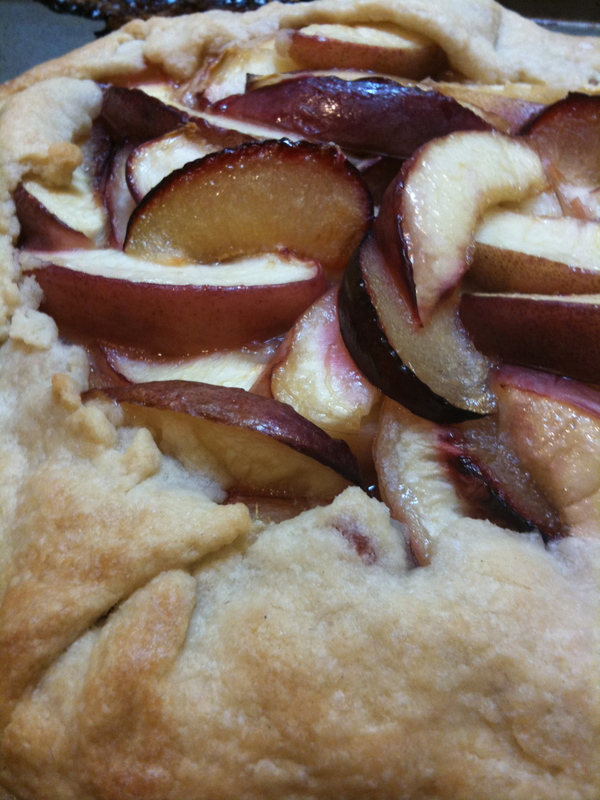 Recently, my baker friend Rosie made a fantastic crostata with plums and nectarines ripe from her parents’ garden. Tart purple-fleshed plums oozed from a thick buttery envelope of golden pastry dough with every pinch of my fork. Feeling particularly inspired last Sunday morning, I whipped up a copycat crostata to take over to my 88 year-old grandma. I was running a bit late, so I definitely could have baked the crostata until it was more browned. prepare the crust (1-hr in advance): Cut the butter into 1/2-inch cubes. Since butter softens rapidly, return cubes to refrigerator for at least 10 minutes while you set up other ingredients. Place the flour, sugar and salt in the bowl of a food processor fitted with the steel blade. Pulse a few times to combine. Add the butter, tossing quickly with your fingers to coat each cube with flour, taking care not to touch the blade. This prevents the butter cubes from adhering together and helps them to break apart and combine more evenly with the flour. Pulse 15 times, or until the butter particles are the size of small peas. With the motor running, add the ice water all at once through feed tube. Process for about 10 seconds, stopping the machine before the dough becomes a solid mass. Turn the contents of the bowl onto a sheet of aluminum foil, pressing any loose particles into the mass of dough. Roughly form the dough into a 7-inch disk. Cover the dough completely with aluminum foil and refrigerate for at least 1 hour. The dough may be refrigerated up to 2 days or frozen up to 2 weeks (defrost for 30-45 minutes at room temperature before use). Makes 20 ounces of dough — enough for one large tart, two 9-inch shells or four little tarts. prepare the crostata: Preheat oven to 450 degrees. Slice fruit into 1/2-inch slices. Sprinkle sugar and vanilla over fruit mixture and let sit about 20-minutes, until some juice is released. Roll the dough on a lightly floured surface to an 11-inch free-form circle (use about half of the dough from recipe above). Transfer to a baking sheet and sprinkle with 1 tablespoon sugar. Leaving 1 1/2-inch border all around, cover the dough with the drained fruit mixture. Raise the dough border to enclose the sides of the tart, letting it drape gently over the fruit. Press down on the dough at the baking sheet, snugly securing the sides and the bottom of the pastry; be careful not to mash the fruit. Gently pinch the soft pleats that form from the draping. Bake the tart for 20 minutes until the fruit has given off some of its juice and the dough is golden. Cool on a rock for about 10 minutes and serve while still warm and aromatic. You can brush the fruit with jam or the leftover sugar/vanilla juices, if the top looks dry.